Popup Maker contains a set of debug tools that provide detailed information about plugin settings for each popup. The toolset can be activated either from the plugin Admin or within the browser. This article describes how to enable the debug tools, and the type of information that they can provide. 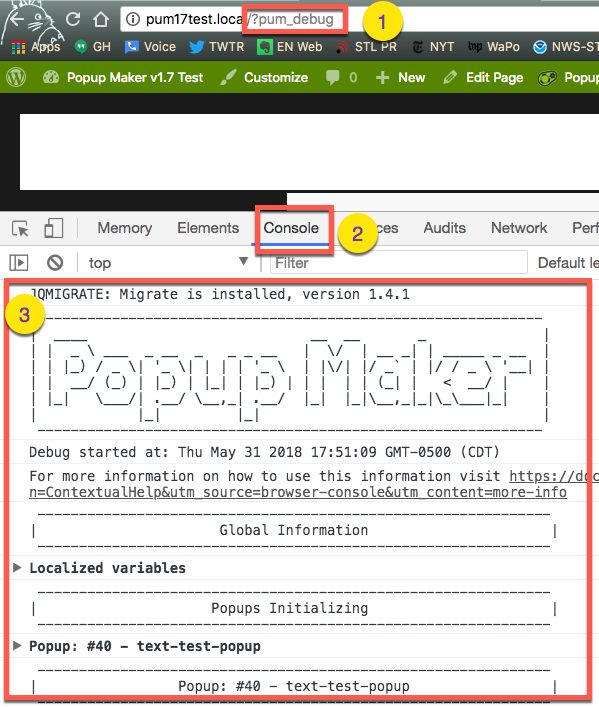 From the WordPress admin, open the Popup Maker Settings submenu. Select the Misc (miscellaneous) option, and the Misc category. Check the box labeled Enable Debug Mode. By default, this plugin feature is turned 'off' (disabled). This option provides plugin users with access to the plugin debug toolset. Enabling the feature from the plugin admin requires Admin level site access. The toolset remains active until it is turned off (checkbox set to 'unchecked'). Related article: Settings submenu // See Misc (miscellaneous) option, item 3. Debug tools can also be activated from the front end of a website via the browser address bar. No Admin login to a site is required. The toolset is enabled by adding the query string ?pum_debug to the end of the site URL. The debug tools remain active as long as the modified URL remains loaded in the browser. Debug tools allow users to evaluate the current publication status or targeting condition of a popup. Popups set to 'published' and targeted to activate on page load will be listed in the Console box using browser inspection tools. This can be confirmed with the Popup Admin Toolbar (also known as the ‘debugger menu’) visible on the front of a website. The debug menu will not list a popup that is either unpublished or targeted not to appear on that page.